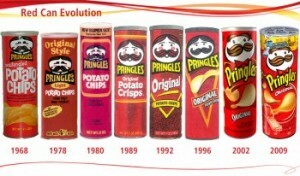 For over 40 years, Pringles, a potato-based snack chip, was the much “beloved” product of Procter and Gamble, it is currently sold in 140 countries and advertised in 37 languages and offered in over 50 flavors. The “one of a kind” stackable snack chip was developed over a lengthy period of time in the Cincinnati plants of P&G, with Fredric Bauer developing the Pringle chip shape (saddle shape so as to be able to be stacked) and the iconic paperboard canister, while Alex Liepa devised the robust flavor. This chip (or crisp as it was originally termed) was the answer to the crumpled, greasy chips in the typical chip bags half filled with air. The term “Newfangled’ was dropped from the name after the courts determined that it was just a chip; in the UK there were also legal problems because of the work crisp and whether they should be considered a luxury tax item). The name Pringles is also steeped in stories, whether you believe it is derived from the name of Mark Pringle, holder from 1937 of a potato-processing patent or the result of the random last name selection by P&G directors from the Cincinnati phone book. One rather amazing side story involves Fred Bauer who insisted his ashes be partially buried inside a Pringles can. Today, the iconic snack is produced in Tennessee, Belgium, Malaysia, and China, with 42% potato content, fried and packaged in over 50 flavors and combinations. The standard flavors include original, salt and vinegar, cheddar cheese, ranch and BBQ. International regional flavors have been added: In Asia, there is seaweed (green colored) and grilled shrimp flavors, while in the UK, Pringles are available in wasabi and curry varieties. There are also seasonal flavors, such as ketchup and dill pickle flavors for summer and peppermint white chocolate (as of December, 2012). The easily recognized logo, of Julius Pringle, a cartoon drawn, male head with a mustache and dark hair divided into bangs, has been on the can since the beginning.